The gamble is that increasing tax rates on the wealthy will not cause them to alter their behavior to avoid the increased tax expense and as a result, will result in much greater tax receipts. I think most Americans assume that the wealthy are paying less taxes under Bush. But that’s not the reality. While Bush did cut their rates, the effect was to increase the their share of federal tax receipts. In fact, the top 5% are paying a greater share of taxes now under Bush than under Clinton. Hard to believe right. To paraphrase AMEX commercials, ‘populism’ [lying to the willfully ignorant], has its rewards. If you still want to believe in Santa, you might want to avoid these US House of Representatives reports on who actually pays federal taxes – top 1% and progressivity of tax system. Also, check out the Bloomberg.com article which also documents how progressive the actual tax system is, as opposed to the populist perception. Markets are not politically correct. What they care about are the likely tax and spending policies for the next American president. No serious person believes the Obama campaign claim about excluding 95% of Americans from tax increases. So among the many negative factors affecting the market, are the expectations of widespread increases in taxes, which during a recession is considered a mistake. Unfortunately, campaign tactics hold no sway here, i.e. ACORN can’t recruit citizen-prostitutes to enhance or alter market results, George Soros notwithstanding. This entry was posted in Business & Economics and tagged Bloomberg, Federal taxes. Bookmark the permalink. A few comments. (1) Your information, as presented, is true but misleading. 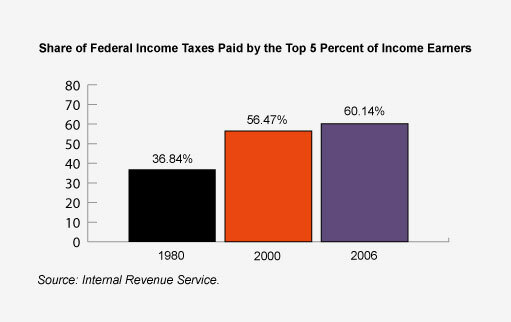 You note that share of taxes by the top 5% has gone from 36.8% in 1980 to 60.14% in 2006. All well and good.But what you don’t show is that since 1980, the average income of the top 5% has doubled since 1980, while the median income and the income of the bottom 5% have barely changed. You can see this here:http://www.prospect.org/galleries/default-image/A3_chart.jpgI think that would add more perspective to the discussion. (2) The problem with comments like these is. they ignore an inconvenient truth: taxes are necessary to pay for government expenditures. If the government had zero expenditures, then there would be no need for taxes. But obviously, this is not the case. For those in government who are pondering tax policy, OF COURSE there is an understanding that taxes alter behavior. I think it is fairer to say that increased tax rates are recognized as evil, but are seen as a NECESSARY EVIL. The only way to eliminate this EVIL is to decrease spending. But NEITHER party is able to do this. The GOP, for example, with control of the presidency and congress for 6 years, rang up half as much debt as the US incurred from George Washington through Bill Clinton.To be clear: I have no problem with raising the alarm that higher taxes have a negative consequence on behavior. My point is, what other alternatives do we have, given that there is absolutely no political will to cut spending? Answer: there is no alternative. (3) I understand the point being made here, which is that many Americans don’t really know how the tax burden is distributed among the population. Fair enough.So, let’s all agree that voters are ignorant and irrational. Now what?Let’s get to brass tacks: are the rich paying an “unfair burden?” I find quite often that, critics of tax policy don’t want to come out and say that.Let’s assume that higher taxes will negatively alter behavior. Does that make them “unfair?” (The ranks of the US military are disproportionately from lower income groups. So, those groups suffer casualties at a higher rate than other income groups. Do these “nagative” and “unfair” consequences mean we should end all wars? )Given that we have a progressive tax system, the informed know that the rich will pay a higher share of taxes than the not rich.Tell me something I don’t know. Can you prove that the taxes paid by the rich are “unfair?” I’d like to hear that argument. Great comment – I’ll respond according to your notes1) Point taken – it matters that the top 5%’s income has increased dramatically since 1980. The approx 20% jump from 1980 to 2000 speaks to that, but I ignored it.I thought the chart you referenced was too broad [since 1966] to help here. Perhaps you are dealing with a limitation I ran into–I had tough time finding the right place to pull this type of data. The JEC reports were good but took me forever to dig through to find similar info, eventually I gave up–hard to justify that as a Sat night project. In a way I wrote the post around the most useful data I could find. What initially interested me was in quantifying how many people are in the different buckets and the total income in each category. I gave on that idea for now.2- Agreed on the failure to control spending by Republicans – that’s my biggest concern about future spending – who can oppose it? Republicans have lost credibility on this issue.But as to your main point re that if you can’t cut spending you have to increase taxes – 2 points– other than noting that raising taxes during recessions are widely regarded as mistake, I don’t criticize spending or govt excess etc. So I have plead innocent on that one. My big picture complaint is the Obama campaign suggestion that the taxes needed can be derived almost exclusively from the wealthy, ie populism3) The reason I avoid the whole ‘unfair’ discussion is that I’m not a Democrat – I could not in good conscious willingly give up the moral high ground on ‘whininess’ 😉Look there is a debate whether the tax structure is sufficiently progressive from a fairness perspective, but that really does not interest me. I don’t see it is fair or unfair. I see it as how much can be get from them in taxes without harming the economy – higher tax rates create disincentives which hurt all of us in ways that are not obviousHere’s what does interest me – the implied logic that if you need more tax revenues, you raise tax rates. It doesn’t work that way. So if I hear that in a political campaign, what I think is unfair is people voting based on those assumptions.If you have a blog, I would happily reference any further thoughts you have on this subject or consider this my offer to run your ideas here. I appreciate your thoughtful response.I am thinking about doing a blog, but I just don’t have the time. I give kudos to guys like you who can find the time for this.RE: “Here’s what does interest me – the implied logic that if you need more tax revenues, you raise tax rates. It doesn’t work that way. So if I hear that in a political campaign, what I think is unfair is people voting based on those assumptions.”There is a real controversy (or there should be) over whether or not increased taxes on the rich stifle economic growth, and vice versa. Bill Clinton raised taxes on top earners, and we had prosperity and balanced budgets (helped by the GOP, which at that time helped to keep a lid on spending.) Obama can rightly point to that as a selling point for his tax policy.Meanwhile, Bush cut taxes on “the rich” (sorry to use that term), and the economy and the federal deficit have both gone south. This occurred for reasons that go beyond the tax cuts, but it is clear: lower taxes on top earners do not guarantee economic growth; and higher taxes on the rich do not portend economic decline.I wish “conservatives” (if that is a correct label to use in this context) would focus on recent history (past 16 years) and actually come to a reasoned determination that higher taxes on the rich, in and of themselves, are “good” or “bad” for the economy overall. Their current views are not reasoned, IMO, but rather reflect the ingrained reaction that higher taxes MUST be bad, in spite of the experience of the Clinton years.